Today few offices and commercial areas such as, shopping malls, cinema halls, hospitals are found without a HVAC system. They are essential to make indoor air fresh, breathable, and comfortable. Like all electronic systems, a HVAC system also runs the chance of developing technical snags from time to time. In such situations a good repair service provider should be contacted to bring the system back to its bearing. Here are some of common questions that hover in the minds of people seeking repair of their commercial HVAC system. All HVAC systems come have a warranty period. How to know if your system is still within warranty? Usually a HVAC System comes with a 5 years of warranty. If you know the warranty period exactly, find out the label on the outer side of the equipment for a manufacture date. No determine if your system is within warranty period. Warranty periods vary with manufacturers and installing companies. In most cases the service contactors will not check your warranty. If you are really not sure whether your system is within warranty and lost all the concerned documents, contact your manufacturer. The customer support team at the manufacture’s end will be able to help you if give them the model number, serial number, and date of installation. If your system is within warranty tell your contractor about it. Warranties save a great deal of repair cost. When machine is outside warranty, you will have to pay the full retail price for a part that the contractor bought. With the warranty you can get it for free or for a discounted price. Preserve the receipts, invoices, and documentation. These are invaluable if there is a recurrent problem with your system and you need to escalate it with your manufacturer. Is sound from HVAC system okay or alarming? 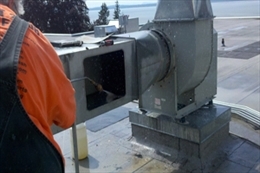 Most heating and cooling equipment produce sound when being operated. Buying a low sound system will not make larger hole in your pocket. But sound from the HVAC can affect the comfort level of people working inside the building. The amount of sound a unit makes depends on variety of factors like its age and model. A model with insulated compressor will make lesser sound than those without insulation. Today there are systems that make little or no sound. So when you compare the systems of various brands always ensure that you select one that makes the minimal sound. What to do if the heat pump ices up? It is quite natural for the heat pump of your HVAC system to ice up in winter and in certain weather conditions. The entire coil can be covered in ice. But if the entire unit is covered in ice along the inside of the coils for a long period of time then it needs to be inspected. 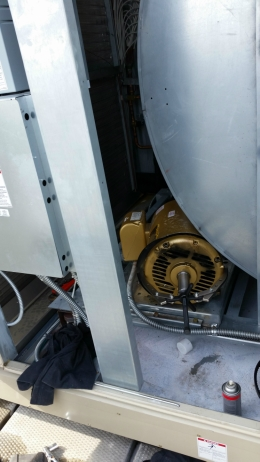 Leaving it in existing condition can both skyrocket your bills and cause damage to the system such as broken blades, crushed coils, and leakage of the refrigerant. Heat pumps ice up but also have the defrost cycle to de-ice the coils. Many systems have timer that defrost it from time to time. There are systems with solid-state control modules and temperature sensors which will defrost in case of an ice build-up and in extreme temperatures. There are systems which can sense outside air, the refrigerant temperature inside, and run time. Always check if the system can be fixed by you before you call for professional help. If the coil is blocked due to leaves and snow drift you can get them cleaned by a cleaning staff. If the unit has sunk in the grounds leaving no space for the ice to melt and drain then it can be corrected by you. Seek the help of some staffs to get it done. If the frost is due to a leaking gutter atop the unit or due to freezing rain, then these do not need repair experts to come. However call a professional if the timer for defrosting is not working. In case the ice build-up is due to problems in thermostat, sensor, reversing valve, solenoid coil, outdoor fan motor or low refrigerant charge then professional help is required.